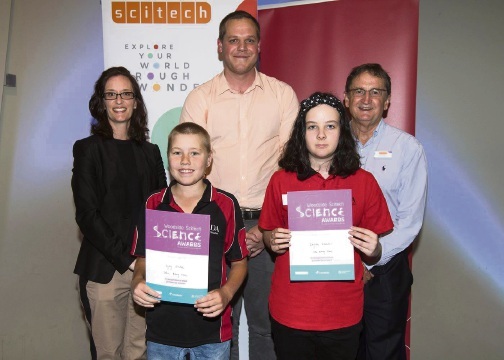 LEDA Primary School students Ryley Windon and Kaylah Kamid received Woodside Scitech Science Awards at a red-carpet launch. The awards recognise two graduating Year 6 students from participating schools who demonstrated excellence and passion in science lessons throughout the year. “It’s fantastic to see such a strong focus on STEM in WA schools, with more teachers actively tackling problems of STEM disengagement and recognising their top students,” Woodside Scitech Science Awards co-ordinator Megan O’Sullivan said. Woodside Scitech Science Awards support science growth and interest in the community by providing a greater awareness of the critical role science plays in today’s society. Each award recipient will be recognised at their graduation ceremony and receive a certificate, free pass to Scitech, science encylopedia, and discounted CSIRO Double Helix subscription.